The SQL EOMONTH is one of the Date Function is used to display the last month of a given date. This function allows you to add second argument (which is optional) to move forward and backward. 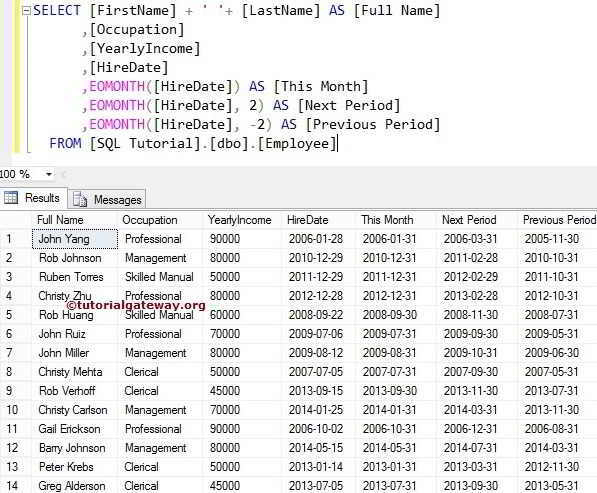 In this article we will show you, How to use SQL Server EOMONTH function with live example. Date: Please specify the valid date. It can be column data, expression or any variable. If you specify the positive integer as the second argument (Number), Sql Server EOMONTH function will move forward to specified number of months and display the last date of that month. If you specify the Negative integer as the second argument (Number), EOMONTH function will move backwards to specified number of months and display the last date of that month. In this example we are going to use the Custom SQL query and find out the Last day of current Month, Previous period and Next period using EOMONTH function.